(MP146). Ossie Jones (1947 -). Watercolour signed and dated 2008. Standard size: 14 x 10 inches (35.5 x 25.4 cms) approx but available in sizes as required. Commissioned by Maritime Prints & Originals for The Association of Royal Navy Officers’ 2008 Christmas card, this scene was painted to celebrate the forthcoming centenary of the Royal Navy’s Fleet Air Arm. 2009 sees the centenary of what is now recognised as the first powered flight in UK conducted by Samuel Cody: a full 5 years before this he was already experimenting with tethered flights of manned kites from RN warships and indeed the Admiralty in an early piece of enlightened procurement, did order their first flying machine, HM Rigid Airship Number 1 on 7th May 1909. This is the genesis of the Centenary of Naval Aviation which the Royal Navy will be celebrating in 2009. In spite of the rapid advances in maritime aviation - from the establishment of the Naval Wing of the Royal Flying Corps in 1912 (the early pilots often funding their own flying lessons) to the formation of the Royal Naval Air Service in 1914 - the creation of the RAF in 1918 presaged a long period in the resource wilderness. At the time of the merger of the RNAS and RFC into the new fledgling air force, the former contributed 67,000 officers and men, 2,949 aircraft, 103 airships and 126 coastal stations. In 1937 with the return of the Naval Air Branch to Admiralty control and renamed the Fleet Air Arm of the Royal Navy, it consisted of 20 Squadrons with only 232 aircraft - and pretty poor aircraft at that. Once again, however, with the impetus of war in 1939 the FAA had grown by 1945 to a strength of 59 aircraft carriers (of various types), 3,700 aircraft, 72,000 officers and men and 56 air stations (scattered around the globe). The story from then on is more familiar, the decline in overall naval strength inevitably leading to a steady run down in the maritime air capabilities of the Fleet. The FAA has been heavily employed in the many global operations that have been conducted by British Forces since Korea - including in Iraq and Afghanistan - and the commissioning of the two big carriers, HMS QUEEN ELIZABETH and HMS PRINCE of WALES within the next decade should see a reversal of the fortunes of British naval aviation. 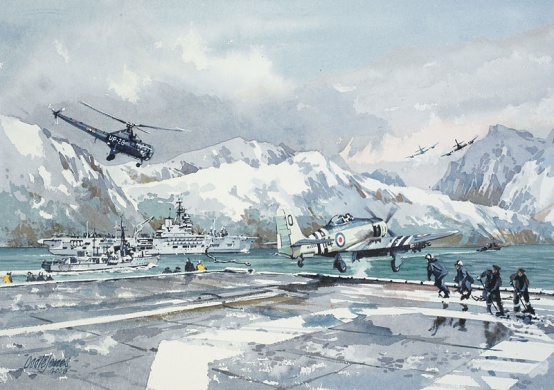 Painted here is a scene in the winter of 1951-52 during the Korean War when the RN rotated 4 carriers on UN operations together with the Royal Australian Navy’s carrier, HMAS SYDNEY. In the foreground of the picture the flight deck of HMS OCEAN (Captain C L G Evans DSO DSC RN) is having the final pockets of snow cleared as a Hawker Sea Fury is launched. It was in a Sea Fury that Lieutenant P Carmichael RN of 802 NAS was to shoot down a Soviet MIG-15 jet on 9 August 1952. Seen over OCEAN’s flight deck is HMS COSSACK (Captain W A Adair OBE RN, Capt D8) stationed as surface plane guard whilst overhead a USN Sikorsky S-51 (Dragonfly) on loan to the RN participates in an early trial of aerial plane guard duties. In the background is HMS UNICORN (Captain R R S Pennefather RN) who although classified as a Repair and Maintenance carrier found herself pressed into frontline duties and even managed a spot of shore bombardment as well! By the time the Korean War truce was signed in July 1953 British and Australian FAA crews has flown some 23,000 sorties and had reinforced the fact that maritime air power was the new core around which ocean going fleets would henceforth be based. Indeed, at the Queen’s Coronation Review a month before that armistice was signed, 7 aircraft carriers were present in the lines and over 300 aircraft of the FAA roared past overhead.